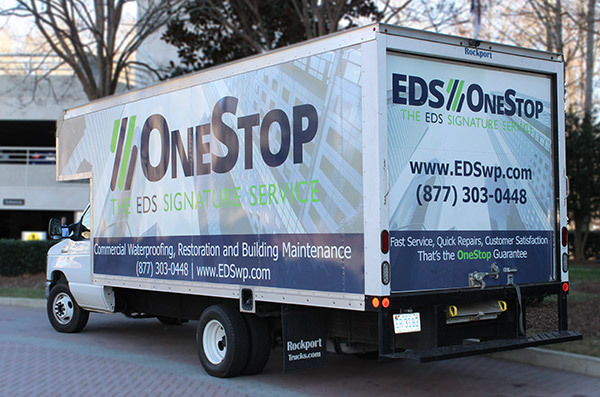 OneStop is EDS’ small project team, committed to fast service, quick repairs and customer satisfaction. EDS understands the frustration of minor leaks and repairs causing major problems with your building tenants. OneStop was created to ease the pain and stop the trouble quickly, all while guaranteeing the EDS Signature Service of prompt and professional customer satisfaction. Stop Tenant Complaints. With OneStop, minor building leaks and repairs are handled quickly and professionally, with little interruption to the tenant. Our professional OneStop team will utilize rope descent systems to quickly and cost-effectively access your building without the noisy hassle of expensive lifts. Stop Frustration over Minor Issues. Rest assured knowing that OneStop will handle your minor repairs and make them the least of your worries. A confirmation start time and a post job conditions report will keep you at ease from start to finish. Stop Getting the Run-A-Round. Most contractors aren’t equipped to handle small jobs efficiently and in a timely matter. EDS developed OneStop with the promise that our smallest jobs are assured the same Signature Service given to large scale projects, including accurate schedule updates and detailed conditions reports. Call OneStop today and request a free estimate for your small project repairs! Fast Service, Quick Repairs, Customer Satisfaction – that’s the OneStop Guarantee.